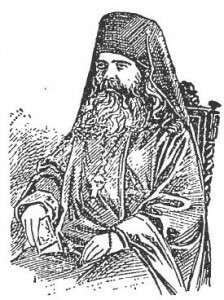 In the life of St. Raphael Hawaweeny published by Antakya Press (page 24, to be precise), there’s a reference to an early Syrian/Antiochian chapel in New York, dating to 1893. The story goes that a visiting Antiochian priest, Archimandrite Christopher Jabara, established the chapel at Cedar and Washington Streets in New York City. Unbeknownst to the local Syrians, however, Jabara espoused a radical, heretical theology, rejecting the Holy Trinity and calling for the unification of all religions — and especially a merger of Orthodoxy with Islam. Jabara was a speaker at the Parliament of Religions in Chicago, and his talks were reported in the New York newspapers. Jabara was “compelled to leave the country” and eventually died in Egypt. To read more about Jabara, check out this article I wrote two years ago. The members of the Syrian Orthodox Greek Church who have been worshipping in the Greek chapel in Fifty-third street have now a chapel of their own on the top floor of the building at the northeast corner of Cedar and West streets. The chapel was dedicated yesterday morning at 10 o’clock. The service, which was in Greek, Arabic, and Russian, was conducted by Archimandrite Christophoros Jebarah, assisted by two priests from the Russian war ships now in the harbor. The Russian Vice-Admiral and a party of Russian sailors attended the service. Jabara’s own weirdness aside, this is a really fine example of early inter-Orthodox cooperation. At the time, the only Orthodox church in New York was Greek, so that’s where all the Orthodox went — regardless of ethnicity. (Other sources tell us that the local Russians also attended the Greek church.) And when the Syrians opened their own chapel, the visiting Russian clergy and sailors came out for the dedication. Orthodoxy was small and new in early 1890s America, and the Orthodox, of necessity, had to work together. Of course, once the necessity passed, the Orthodox were content to break up into their respective ethnic groups. Anyway, the Syrian chapel failed pretty quickly. It’s clear that Jabara wasn’t the right man to lead the church, but two years later, the right man, Archimandrite Raphael Hawaweeny, arrived on the scene, leading the Syrians until his death two decades later.